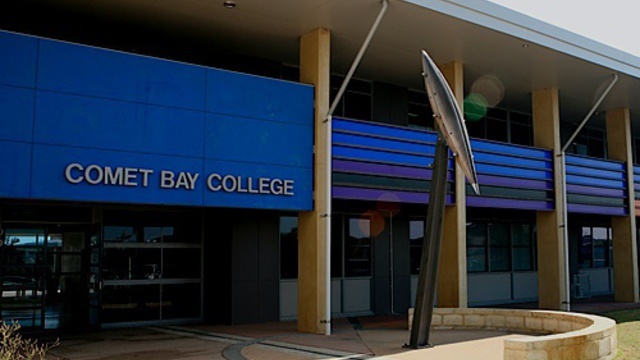 Located in the coastal suburb of Secret Harbour in the South Metropolitan Region, Comet Bay College is an Independent Public School with large, modern, state of the art educational facilities, catering for students in Years 7-12. Our College has a clear focus of providing a safe and inclusive environment ensuring all students feel welcomed and are able to achieve their full potential. The Resilience Emotional Awareness, health and Careers Program (REACH) ensures our students in year 7-9 are provided with the opportunity to learn vital skills and develop key understandings that will set them up to be successful lifelong learners and positive, resilient members of our community. Our fully select Gifted and Talented (GATE) and Australian Football Specialist Program, together with our Arts and Academic Extension Programs, continue to attract significant community support and involvement. All of these programs offer students outstanding and unique opportunities to excel in an environment that provides exceptionally high quality facilities and teaching. This focus on a positive culture across the College prepares our students for success in Senior School as they access a wide variety of courses that only a large senior high school can offer. This success is reflected in the continued high performance of students from Comet Bay College in the both the ATAR(University) and Vocational Education and Training Pathways as we continue to “Seek Excellence “ in everything we do.